Last summer when we flew to Colorado MJ was one year old. I had tips then for flying with a one year old (read about them here). It took me a bit by surprise this year on our flights to Washington, DC, but flying with a 2 1/2 year old is a whole different ball game. 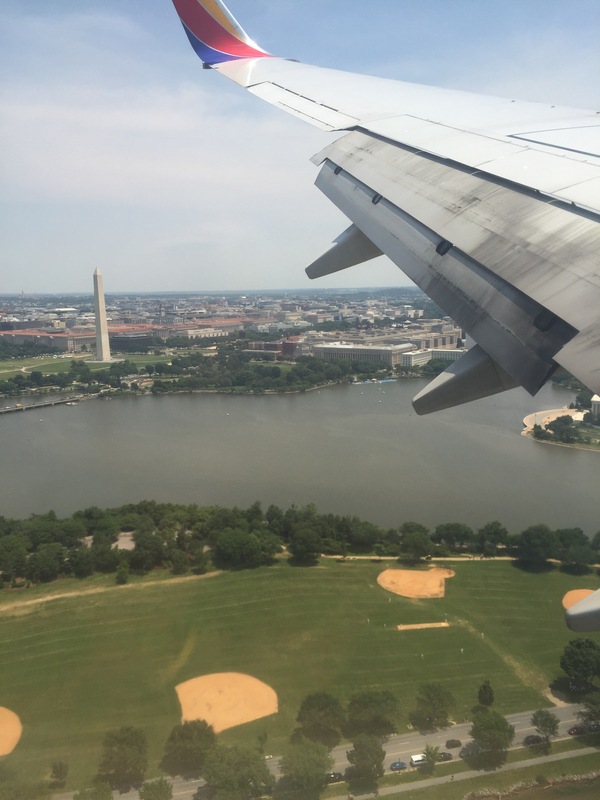 This summer’s travels had not one, but 3 different planes! 1. Snacks, snacks, and more snacks. We usually fly Southwest Airlines, which allows you to bring snacks. On our way to DC we packed MJs favorite cereal and her goat milk. (We took the powdered goat milk in a container and water in her cup. Both have to be tested by security.) On our returning flight we loaded up more snacks: strawberries, bananas, cereal, raisins, and again, milk. She got juice and pretzels on the plane. 2. Cup and pacifier for cabin pressure. Xander used to get terrible headaches from the cabin pressure. We tried everything to combat it: gum, earplanes, etc. The cup and pacifier (I know, we haven’t weened her yet) have proven helpful in warding off the cabin pressure. She had one small bout of it, but the pacifier quickly eased her pain. 3. Books, toys, and babies. MJs favorite baby doll, Daniel Tiger, Tron, a stack of books, and a coloring book and crayons were all in her carry on. When all else fails and you’ve got a crying toddler, Southwest Airlines offers free onboard Wifi with Mickey Mouse Clubhouse. 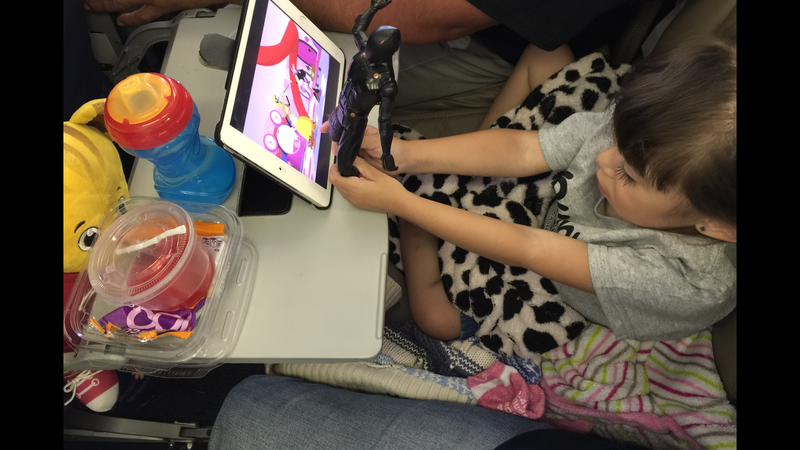 Now that MJ is a ticketed passenger and has her own seat, there was plenty of room for all her entertainment. 4. Don’t check that stroller! The first time we flew with MJ we checked her stroller with our luggage. We later learned that we could take her stroller all the way up to the gate where we boarded the plane. This way, we pushed MJ around the airport while we waited to our flight and had it the second we got off the plane. Convenient. MJ is much more mobile and curious this summer, and we alternated between holding her hand and walking in the airport or strapping her in the stroller. She alternated frequently. She wanted to explore, we didn’t want her lost in the crowd. 5. Family Boarding. Southwest offers family boarding for families with young children. No matter how early we check in, we can never seem to get in the A Group, but luckily, families with young children are able to board immediately after, ensuring the family will be able to sit together. Line up at the gate early, because other families know this too and they’ll want to be first in line with their kiddos. 6. Pack your patience and hope that fellow flyers did too. Depending on the length of your flight, your toddler will probably grow restless sitting in their seat. Get out the toys and books and snacks and be patient. Their little bodies are not built to be seated for long. MJ had a small crying (ok, screaming) session and luckily other passengers were patient.